Internet can be harmful for the kids. Therefore, parental controls will be useful effort to keep out the kids from inappropriate website usage. This can filter your website and also blocking illegal access to harmful sites. In fact, there are different methods to do this, from configuring your router to using Windows’ parental controls or software. Website filtering becomes the best effort to prevent youngsters from bad sites. It also prevents them to access the dark sides of internet. So, what are the methods we can use? One of the best methods to set up useful parental controls is by performing configuration of your router. Router has the function as the clog point where all of the traffics for the network’s streams pass through. Setting up parental controls on your router allow you to filter websites for different devices on the network such as tablets, smart phones, computers, and also game consoles that are built-in connection. Most of routers have built-in filtering configuration. You can check on the box or manual about this feature. You can go to the router’s website-based configuration and set up the filtering / parental controls for your entire network. To do so, you should change the router’s DNS server configurations to utilize OpenDNS. However, some routers don’t have this feature. OpenDNS parental control configuration is quite easy. It’s the same as changing particular feature to your wireless router. There are also many instructions to perform this setting. The focus should be on any contents that you need to block. OpenDNS might take effect to your entire household. It affects family computers as well as gaming consoles. OpenDNS parental control also provides the insight of any websites that have visited on your network. This allows you to monitor any illegal access of bad sites. If you find out any inappropriate sites, you can block them immediately. There’s another advantage by using this method. It becomes a new communication channel with your kids. OpenDNS might help to create a Web safety dialog and appropriateness. It helps you to build communication with kids. You should explain about any blocked sites to your kids. They would clearly understand the logic of such restriction. 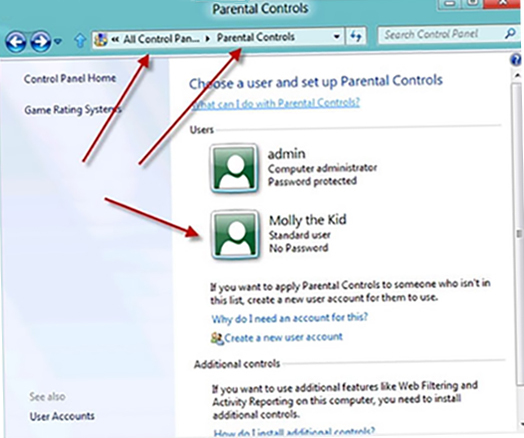 Windows 7 offers a feature of parental controls. It helps you to control what time to log in into the computers and what programs / sites it can use. This is quite useful if your children use different user accounts on the computer. However, this operating system doesn’t have a web filter. The manufacturer still offers Family Safety, a free program allowing you to set up web filtering on Windows 7. You can install this program on your Window 7 operating system and you can manage its configuration freely. This program is also available as the part of essentials package from MS Windows. Both of Windows 8 and Windows 10 have combined parental controls that integrate Windows 7’s program access & time limits with web filtering of Family Safety. It also offers more new features. You can configure the view reports and settings from the same Family Safety site. You only need to check out the account usage box when configuring a new client account on Windows 8 operating system. This account later will be patented as a kid’s account and can be controlled from the Family Safety site online. You can read more about this configuration through tutorials or any different resources. You can also choose third party software as your parental controlling. Much internet security software comes with this parental control feature. If you own a security suite on your computer, check if it has the feature or not. There have been many different dedicated security suites that offer payable parental control solution. The most famous one is Norton Family application for parental control and web filtering. In fact, there are many options of free software that you can use. You don’t need to pay any single penny to use it. Norton offers free application that has been used widely around the world. Try doing a review online and you’ll find out many options available based on your necessity. Of course, there’s no software that offers perfect result. They can’t block everything that is bad. Even sometimes the software blocks good sites. However, parents can limit the risk for the kids of being exposed to bad contents. Internet and computer are wonderful resources for any children for educative purposes or entertainment. Yet, this also has the negative potential for the kids. There’s no guarantee of the safety. Therefore, 4 methods of web filtering above can be your basic safety lines of internet usage at home. Spyrix Keylogger – Cloud-Based User Activity Monitoring Software. By installing this application, you will get complete control over your child’s activity on PC. Moreover you don’t need to have a direct access to the PC to view activity logs. Spyrix Keylogger is a cloud solution. All collected data is sent to cloud server. Collected information can be viewed remotely via web account from any place and any device. keylogger, screenshot logger, records of activity in Internet browsers and social networks including facebook, records of search queries in google, yahooo, bing, logs of chat in Skype and other IMs, records video from web camera that will allow you using Spyrix Keylogger as a surveillance system.